InsideToronto has the cool story of Mellina Orr, a young woman helping her community and bootstrapping her own non-profit. Mellina Orr has always had a passion for helping youth and other residents in her neighbourhood: Weston. The UPX struck a pedestrian in Weston on Thursday—though quite how this could be possible is a mystery given the fences and walls surrounding the tracks. The man was struck just east of the station. It’s the second time someone has been struck in Weston. shot near Jane Lawrence at a pool. Another young man was shot at Sheridan Mall. Weston and Mount Dennis have had little firearm violence so far this year. The Alia N Tanjay at the Crossroads Plaza has closed, joining HomeSense Home Outfitters, the Asian Market, and some smaller retailers. Anne Marie Aikins … confirmed plans for adding a Mount Dennis stop to UP which will require additional funding. This is great news: the UPX will be that much closer to worthwhile public transit. The only problem: the fares, which will be announced next week, are expected to be more than $20. The article contains few other details, but I think it’s safe to assume that the UPX would intersect with the new Eglinton LRT and/or the SmartTrack. Mount Dennis is shaping up to be a new transit hub. Laura Albanese took the gloves off yesterday and released a letter asking for a “fair fare” for the UP Express. While she had asked for smart pricing of the train in August, this letter comes before the December 11 meeting of Metrolinx, where the fares are likely to be announced. Albanese is in favour of using the UP Express as public transit. She notes that the CEO of Metrolinx has said that there will now be six stops on the line: Union, Bloor, Eglinton, Weston, Woodbine, and Pearson. $30 fares would take the public out of the transit. To reiterate, the fare should reflect the fact that the UP Express is a publicly owned service, built and paid for with public tax dollars. The letter is worth reading in its entirety if you have the time. Sullivan picks up the slack left by the city. Mike Sullivan says he went to his councillor for help; got nowhere and ended up doing the job himself. After the latest storm to hit York South-Weston, a political one may be brewing. While out canvassing on march 14, Sullivan observed that the only working sidewalk under the Lawrence Avenue rail bridge was in a dangerous condition. Federal Member of Parliament Mike Sullivan is the opposition deputy critic for persons with disabilities and thought that even with the stretched resources of the city, after two days, something should have been done. According to Sullivan, he left a message with his councillor Frances Nunziata and after waiting a few hours with no action, Sullivan and his assistant Branden Valente did the job themselves. Sullivan described the process in the video below and is openly critical of the level of service given to York South-Weston which is a Priority Neighbourhood. While there’s no love lost between the two representatives, Sullivan’s action will resonate with those who feel that York South-Weston has been neglected for years. 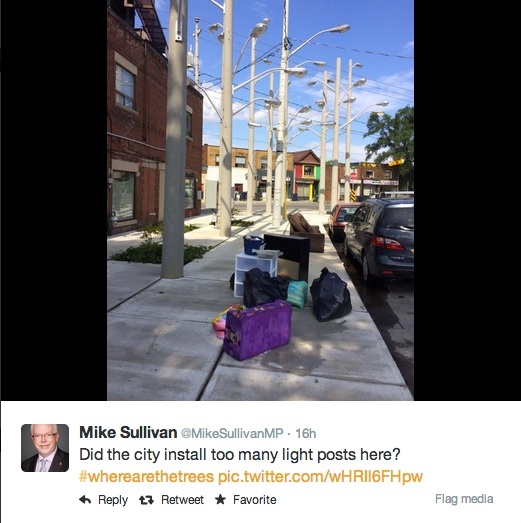 Author Roy MurrayPosted on March 20, 2014 Categories Infrastructure, PoliticsTags Frances Nunziata, Mike Sullivan, priority neighbourhoods, Toronto, Weston–Mount Dennis, York South Weston9 Comments on Sullivan picks up the slack left by the city.